I can't find instructions for how to set up dotCover to run code coverage on a Silverlight 4 app? Also can I use dotCover to generate results when a browser is run by an external automated test tool? Am I going to get an answer to my question??? I'm kinda confused by how exactly this works? 1) I have a SL 4 application. Let's call it 'MyApp'. 2) I have a test application with lots of unit test. Let's call this 'TestMyApp'. 3) I have the IIS test folder. Let's call this 'TestMyApp.Web'. Following the example above I choose 'cover application' and paste in the URL I get from the Browser when I run the app normally, correct? What PDB and DLL are we talking about here? I've tried the 'MyApp/obj/Debug', 'TestMyApp/obj/debug' and 'TestMyApp.Web/obj/debug' and nothing works. Can you please give some clearer examples? In my case I have no unit test. Instead I'm using a QA GUI test replay tool to run through a set of scenarios. I'm using the 'dotCover/Cover application' menu item to start the URL that includes the Silverlight page. At that point a dialog pops up showing various snapshot options. 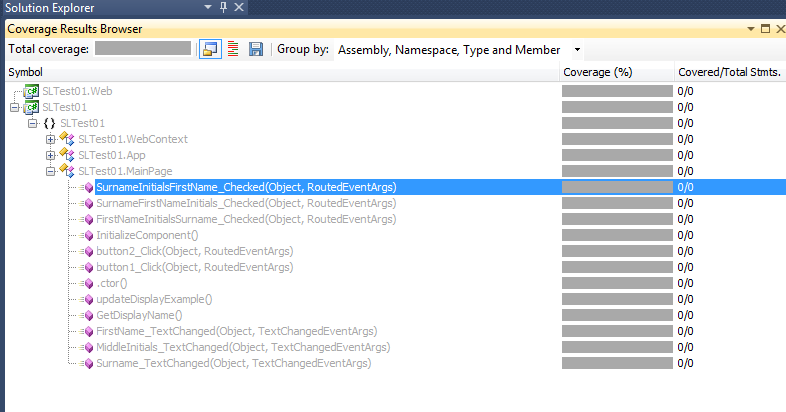 However, when I exit the test app nothing is available - none of the C# classes show any code coverage. Symbol search path is the path to the pdbs of the assemblies being tested. In order to attach our profiling engine correctly web browser should be started from the dotCover. After you finished working with the application, "get snapshot" and "kill process" should be called in the controller window. Coverage results window will be opened. Could you please tell which unit testing framework do you use for your silverlight tests? And how does your development environment configured? This will help to provide more details. For the moment I'm trying to validate the code coverage tool by exercising some of the main page options myself interactively. The browser page is opened. I make a few user actions. If I can get this to work my aim would be to use the 'eggPlant' QA tool to run the test process. I can link to this tool by creating a 'generic' test project inside TFS and using a command line to kick off a process that launches a browser. I've uploaded a screenshot of the dotCover code coverage report view. As I'm fairly new to TFS - are there any debug settings I need to set inside the TFS project for dotCover to work? It looks like PDBs for the silverlight assemblies were not found. Have you specified path to the PDBs as described on the screenshot? What is this path relative to the project folder? that's the folder name I'm putting into the dialog, right? This should be an absolute path to the folder containing actual PDB-files. It's possible to specify several folders. In this case they should be separated with the semicolon. .... and nothing happens. I get zero coverage. As I my test app is tiny - one noddy form backed by one simple C# class - I've uploaded the project as an attachment. I didn't read your instructions correctly. It's the PDB and DLL for the items to test. Since my MyApp actually uses a .NET class library I created, I needed to point to it's PDB folder, not the final application. All is working good now. I've tried setting my SLTest01 project as the start up project and then use the 'dotCover/Cover start up project' and I get even less info - my single C# class doesn't appear in the coverage report. It would be good to have an option where I could right click over a solution/project and activate dotCover that way. You will be able to very soon using Version 0.2 of AgUnit. I'm glad to hear that everything works well now. Regarding AgUnit: we had a conversation with Steven two months ago and I've provided him all info required for the seamless dotCover integration. I have no info about current progress in this direction, but hopefully v0.2 will work fine with dotCover. Thank you - this is very helpful. I can now measure code coverage if I start my app from the dotCover menu in Visual Studio, and use the browser that dotCover opens to do manual testing. What I want to know is how can I use my automated tests, which run Selenium via NUnit - how can I get them to run "in the same process" as dotCover? 1. I open my ASP.NET project in Visual Studio. 2. I use the dotCover menu item "Cover Startup Application"
3. This starts my app in Cassini on a specific port. 5. From there I run my NUnit tests which use Selenium and open browers - I set them to use the same port as my app is running on Cassini. 6. 6. When my tests are finished, I go back to the original visual studio, where dotCover is running, and click Get Snapshot and Kill Process. 7. My code coverage is zero. There is else one way to analyse your automated tests. You can use "dotCover -> Cover Application -> .NET Process". It will analyse all .NET processes started after you will click "OK". Also make sure that "Profile Silverlight applications" option is turned on. Hi Ruslan, I am trying to use dotcover for Silverlight code coverage for manual testing and did follow the discussion/suggestions above but still didn't get any results. I am starting the the dotcover from VS10 after opening the sln file and cover silverlight application, even pdb file path is also mentioned correctly. Please try to point the PDB source at: C:\MRAT_NG\UI\MRAT_NG\bin\Debug and let me know if it doesn't help.